Identifying regular & irregular verbs in the preterito! Car, Gar, Zar, Ir, Ser, AR endings, ER/IR Endings, V stems, Y stems, U stems...THERE IS SO MUCH THE PRETERITE covers! 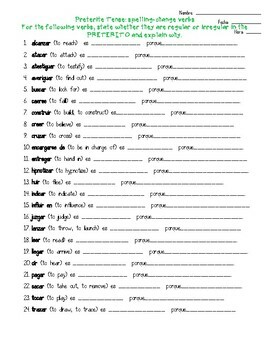 This is an interactive activity for the students to apply what they are learning from the preterit tense. It helps them see all the irregularities on one page and gives them a clear visual of the differences.